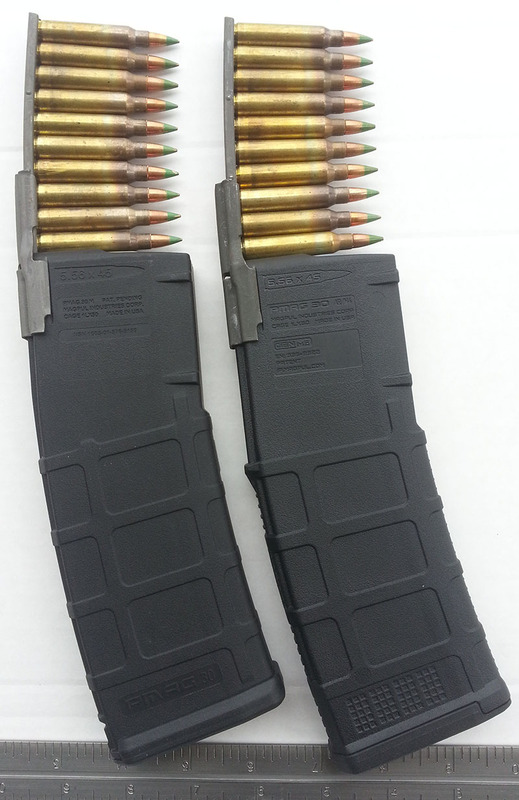 Magpul Industries Corp makes two different 30 round AR magazines that do almost exactly the same thing. Why would they do that? And which one is right for you? We’ll explore the differences and similarities of the two designs together so that you’ll be able to know for sure which mag you want to use to feed your gun. Magpul has been the biggest name in AR-15 magazines since the original PMAG 30 was released in 2007. The PMAG is at least as reliable as the best metal magazines, and it is even more durable. They simply brought a winning solution to market through superior design and materials selection. The PMAG has also gone through several incremental improvements since its initial release. In early 2009, the design was updated to what was commonly referred to as the “Revision M”. The Rev M design is still around, but has been made with an even better material since 2013, at which point it was renamed the PMAG 30 AR/M4 Gen M2 MOE. Since that’s a mouthful, we’ll just call it the M2 PMAG. At the same time that the Rev M design was improved and rebranded, Magpul released an all-new design using that improved material, the PMAG 30 AR/M4 Gen M3, or just M3 PMAG. 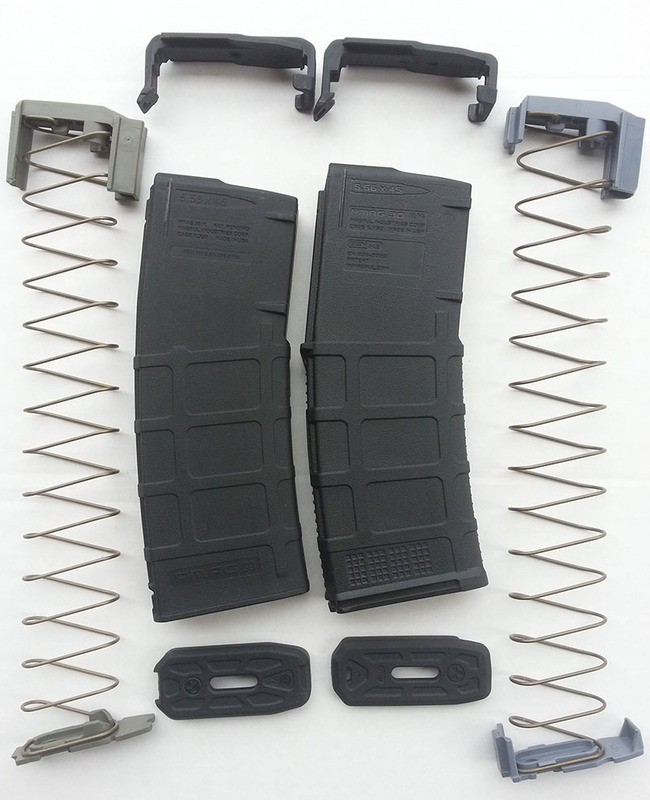 Magpul PMAGs with stripper clips and guides ready for loading. The Gen M3 is on the right in each image. Externally, the M2 and M3 PMAGs have a lot in common. The evolution is easy to see, and from a distance they’d be hard to tell apart. 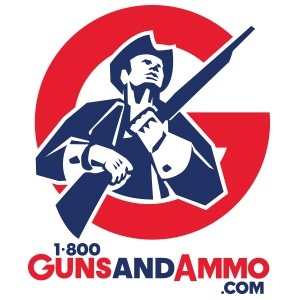 The overall style is the same, they’re both marked 5.56×45 at the top inside a pictogram of a loaded round, and both feature slots to accept stripper-clip guides. But, the subtle changes to the M3 model add up to a big step forward in the state of the art in carbine magazine design. The easiest way to tell them apart is that the M3 mags have a dot matrix molded into the lowest portion of the body on both sides. The 4 fields of 15 dots each make it quick and easy to mark the mags with a paint pen or something similar. This lets you give each magazine a unique identifier so that you can keep different mags for different calibers, or to separate your mags from your buddy’s, or in the chance that eventually you decide to cull one from duty rotation and designate it for training use only. The next most obvious external difference is the M3’s overtravel stop. This little shelf on the spine of the magazine is designed to prevent the mag from being inserted past that point into the magazine well of a gun. On most other mags like the aluminum GI design, an overly forceful insertion can cause the mag body to override the magazine catch inside the gun, especially if the catch is not installed properly. The overtravel stop of the M3 will contact the bottom of the magwell and stop the mag before the notch on the PMAG can go too far past the catch. You can now be as vigorous as you like with your magazine insertions and you won’t get in trouble with your mag. A few billet lower receiver manufacturers, primarily Noveske and Seekins, found that the beveled magwell of their older designs would contact this overtravel stop too early and cause the M3 mags to be difficult or impossible to lock in. Those companies quickly altered their lowers to ensure compatibility with the new Magpul mags. This in itself is a testament to how important Magpul is in the AR market. From there most of the differences are more subtle. The M2 PMAG has a light, orange peel like texture. The M3 mag has the same texture, but it’s just a bit more pronounced. The M2 has ribs around the curved portion of the mag body. The M3 has the same ribs, but they’re slightly taller, providing even better grip. The M3 then adds additional ridges across the front and rear edges of the magazine body that really enhance the surety of a grip on the mag. The ridges make handling easier when removing the mag from a tight pouch, stripping it from the gun during malfunction clearance drills, or firmly executing the push-pull technique to seat the mag while loading. One of the more significant changes that is made in the M3 design is in the dimensions of the tower portion of the mag. The original magazine for the AR-15 was a straight 20 round design. The magazine well of the AR is straight because it was only designed to accommodate that straight magazine. 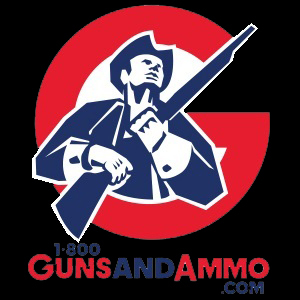 When Colt developed the now-standard 30 round GI mag, they knew they had to curve the magazine to allow the slightly tapered 5.56 cases to stack properly together. But, this curved magazine had to then fit into the straight magwell. The resulting design was a geometrical hybrid. The top 10 rounds or so sit inside a straight column and the 20 below them stack in a curve. The straight top third of the magazine is called the tower. The original PMAGs were designed primarily for the magwell of the AR15 family of weapons. Most other 5.56 rifles are designed to be able to use the 30 round AR magazine pattern since it is part of the NATO draft standardization agreement (STANAG) on magazines and ammo. While these other rifles can accept a STANAG pattern magazine, they don’t necessarily have to adhere to any standard in magazine well design. This caused fitment issues with the earlier PMAGS. The H&K HK416 and USMC M27 IAR, for example, have magwells that are longer in the front than an AR15. An M2 or older PMAG starts its curvature too soon to easily lock into those rifles. Rifles such as the FN SCAR-16, British SA-80 and others also have various fitment differences that can cause PMAGs not to work properly. Originally, Magpul developed a solution (the EMAG) that would fit and work with these other rifles. The EMAG has been phased out in favor of the M3, which extends the straight lines of the tower slightly lower on both the front and rear edge. 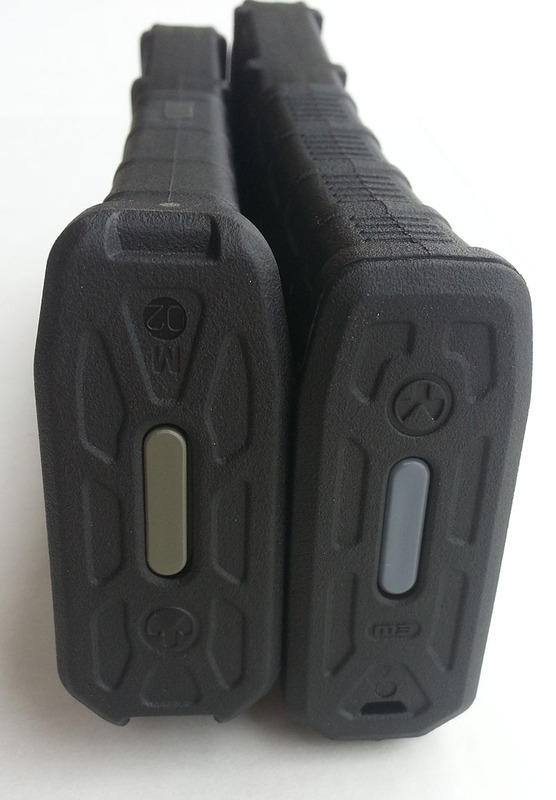 PMAG Gen M2 Floorplate, left, is noticeable larger than the Gen M3. 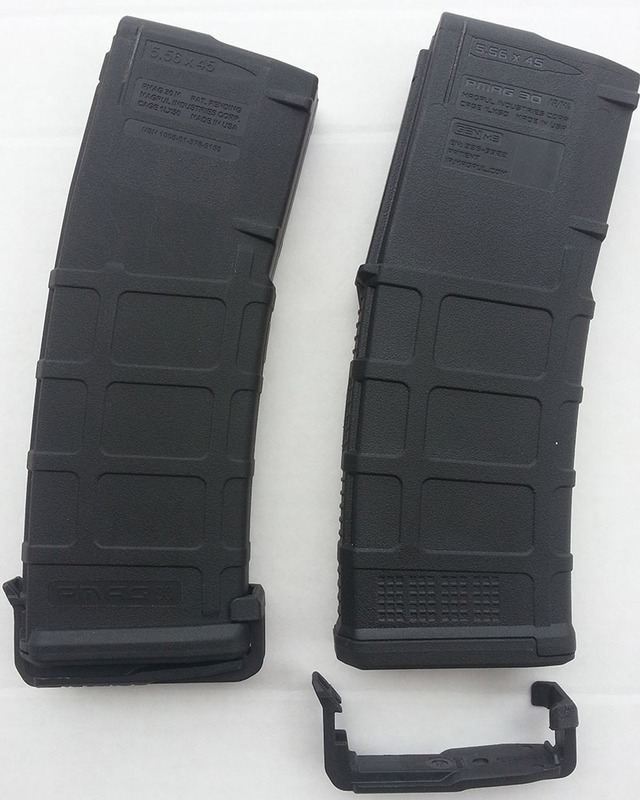 Finally, you’ll see that the floorplates of the two mags are designed very differently. Both magazines can accept Impact/Dust Covers that clip on over the feed lips. The M3 mag includes its cover, but the covers for the M2 are sold separately in 3 packs. Conveniently, the M2 can store its dust cover on its floorplate when not in use. Eventually, this was found to be the least utilized feature of the older design, so it was eliminated. This allowed Magpul to optimize the floorplate for strength as well as to reduce its width. One of the more common complaints about the M2 design is the width of its floorplates. This can cause the mags not to stack as well in some magazine pouches, especially for those that use a bullets-up orientation. The M3 floorplate is narrower and installs from the rear, as opposed to from the front as with the M2. PMAG M2 with Impact/Dust Cover clipped on bottom. By the way, the Impact/Dust Covers just help keep foreign material out of mags and increase the survivability of fully loaded mags and the ammo within when subjected to extreme impact or shock, such as when a resupply is air-dropped. It’s a common misconception that the dust covers prevent feed lip “creep” when stored fully loaded. However, this is untrue. PMAGs do not warp when left fully loaded for long periods, so this is actually not a consideration of the Impact/Dust Cover’s design. The covers are not interchangeable between generations. Differences between the two followers. This brings us to the comparison of the internals. For both models, pressing in on the button in the center of the floorplate allows the plate to slide off of the base of the magazine. This permits access to the spring inside (look out, it’s compressed in there even when the mag is unloaded). The long-life stainless spring retains both the floorplate insert and the follower when removed. The spring itself is the USGI standard and therefore the same in both models, but the follower and insert have slight differences that prevent them from being interchanged. M2 internal parts are molded in a greenish grey color, while M3 internals are bluish grey. With the magazines disassembled it’s easier to see that there are several portions of the M3 body tube that are thicker or are noticeably reinforced as compared to the M2. A view through the mags showcasing the constant curve of the follower’s path. 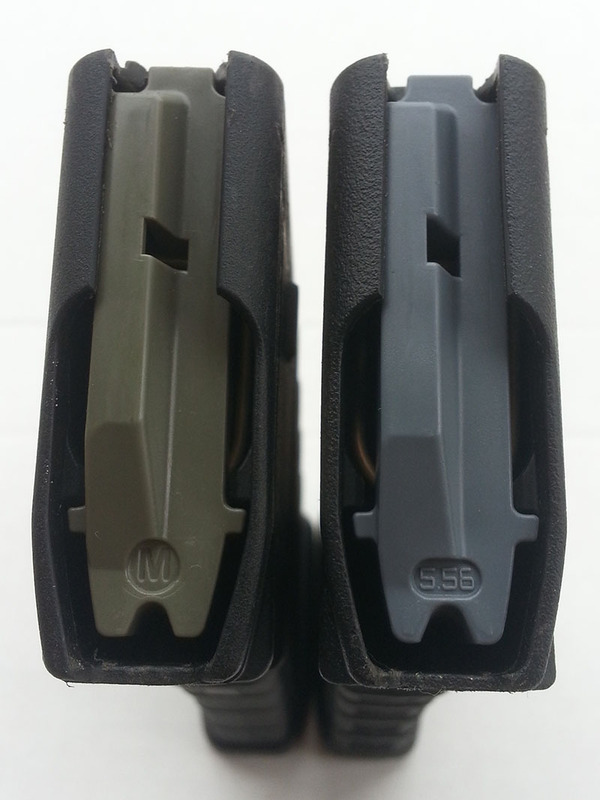 The followers and magazine bodies fit together in such a way that the follower can be depressed into the magazine, but cannot be tilted front to back or side to side. 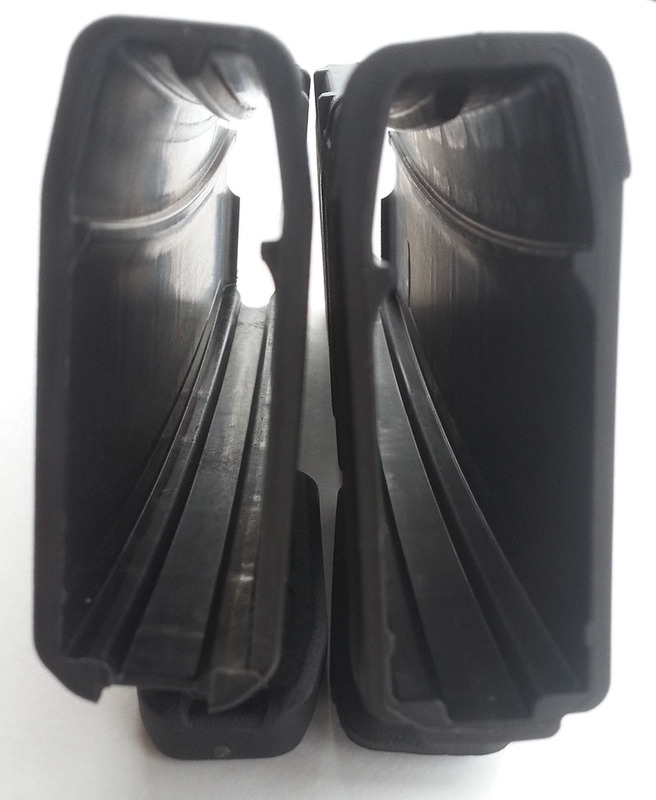 Both generations of magazine body tube feature a constant interior curve, meaning the follower does not need to make any transition from curved to straight the way a GI magazine follower does. Simpler is better when it comes to reliability. There are two more interesting functional difference between the two generations. The M2 30 round magazine is technically capable of accepting a 31st round. This was not done so that you could load a 31st, (and you should not load more than 30), it was done to provide enough slack to the follower so that it could be inserted and locked into a gun while the bolt was closed, as the bottom of the bolt will depress the top round when the magazine seats. Many users still found the force needed to seat a fully loaded PMAG was higher than they liked and this stiffness could sometimes lead to a failure to lock the mag in during a tactical reload. It’s common practice for users of M2 PMAGs (not to mention GI mags and most other brands) to down-load to 28 rounds to make closed bolt mag insertions easier and more reliable. Magpul decided that both issues needed to be addressed with the M3. I tested both and found that round number 31 will not quite fit under the feed lip of the new magazines. But then somehow, the fully loaded M3 is also easier to lock in under the bolt. I think these have been the improvements that impressed me most about the M3. Both mags disassembled to show all components. Finally, it is still possible to order M2 PMAGs in four colors: Black, Flat Dark Earth, Foliage Green, and OD Green. Magpul has stated that the Black M2 MOE magazine uses the same improved polymer as the M3 mags, but I have not seen the same claim for the other colors. In fact it was stated around the time of the update to the M2 MOE that eventually the other colors would be phased out. Each color was actually a different polymer formulation, so when one change was made in the material or mag design, four times the product testing and R&D had to be done to be sure the change was an improvement across all the colors. Standardizing on black still allows you to paint the mags if you need them to be a different color. Obviously the M2 colors aren’t gone yet, so if a factory colored magazine to match your other magpul furniture is what you need, then the M2 is the one for you. Also of note is Magpul’s announcement of a new polymer material expected out during the summer of 2015. This new material was chosen because it shows improvement over the physical characteristics even of the advanced M3 material. As a bonus, it will have a very light tan color they’ve dubbed Sand that will be easy to dye in any color or pattern you choose. In addition to the standard models, both 30 round mags are available in a windowed version. These have transparent panels inset into each side that allow you to see the loaded rounds, or at least the position of the spring, so that you can get an idea of how many rounds you have left before your next reload. The old PMAGs came in two sizes: 30 round and 20 round. The 20 rounder was a straight bodied design that pretty closely matched the lines of the original 20 round GI mags. The old PMAG 20 has since been discontinued, and was replaced by the 20 round M3. The M3 line also includes a new 10 round and 40 round model. Instead of being straight, each of these follow the lines of the M3 30 and feature the same unique constant curve internal geometry. So, if you want a PMAG in a size other than 30 rounds these days, the M3 is the one for you. I have three 20 round M3s, and I find that I use them more than any of my other mags just because of their handiness and overall lower profile. It’s pretty obvious that the M3 is an improvement over the M2. But for most AR users, the choice is between a great mag and an even better one. Most of my mags are older Rev M models. They’ve always worked great, and I felt no need to run out and replace them all when the M3 became available. So what’s the biggest selling point of the M2? The price. Magpul lowered the price of the M2 nearly as low as most inferior budget mags when the M3 was released. Neither is very expensive, but if you need to buy several at once, you can fit a few more M2s into your budget. Before I started my research for this article, I was kind of “over” Magpul PMAGs. I figured I’d try good quality GI mags, or another premium brand like Lancer next. Besides, how often does a civilian like me accidentally crush a GI mag, or permanently distort a steel feed lip? But now that I look back over the facts, I just can’t justify spending as much or more for anything else. When the Sand version become available, I’ll probably expand my collection with a few of the PMAG M3 window models. Bottom line: The PMAG M3 and M2 are superior in most respects to the competition, even when the choice is again between a great mag and an even better one. Shooting Competitions – Why Compete? 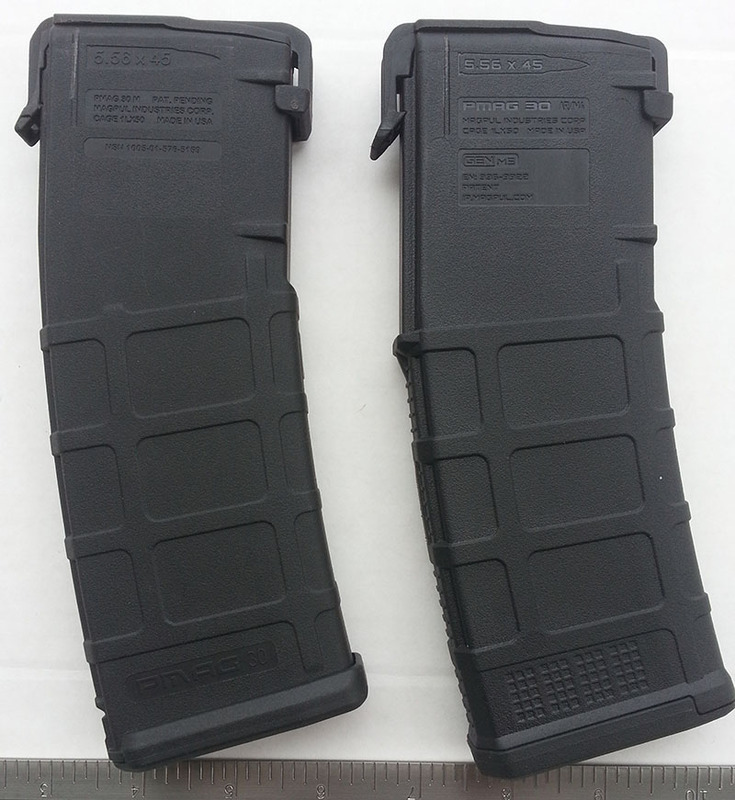 Any info on the internal dimensions of PMAGs? Trying to determine the maximum possible OAL I can load to in my PMAGs. Your best bet would be to contact the manufacturer. We don’t have the exact specs on hand, and we’d hate to give you the wrong info. They should be able to give you all the specs you need. Thanks for reading!